The downward trend in the French automotive industry appears to have bottomed out, and there are signs of a modest rebound. Last year the downward trend in the French car market that had started in 2011 continued. According to the European Automobile Manufacturers´ Association (ACEA), new passenger car registrations in France decreased 5.7% year-on-year in 2013, compared to a 1.7% decrease in the EU as a whole. However, from January to August this year registrations rose again, by 1.6% (EU: up 6.2%). 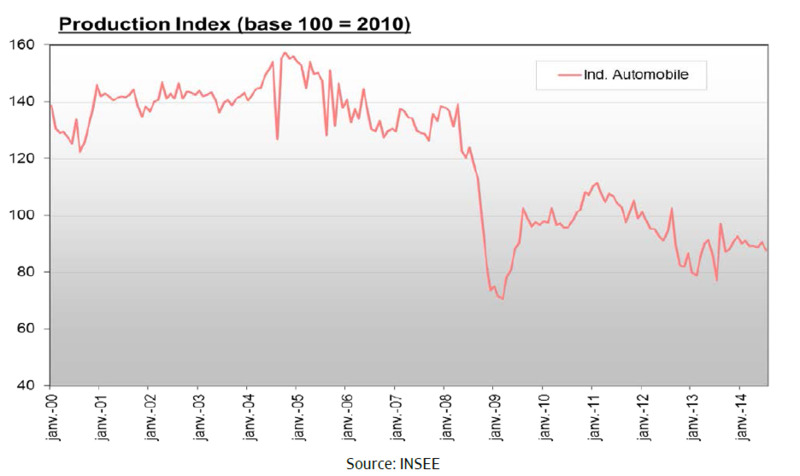 The downward trend in the French automotive industry appears to have bottomed out, and there are signs of a modest rebound. Following a competitiveness agreement signed between the French state and French car makers, car production increased 8.3% year-on-year (excluding Toyota and Daimler production) in the first half of 2014. However, in 2013 domestic production had dropped 11.6%, to 1.74 million cars. That was a massive 42.3% lower than in 2007, and can be explained in part by outsourcing. Production costs are lower in Eastern Europe and Northern Africa: for instance, the Renault Clio, a best seller in France, is cheaper to produce in Turkey than in France. Despite the current rebound, the long-term drop in car production in recent years continues to have serious repercussions for French subcontractors and suppliers, most of which are traditionally linked to French car manufacturers like Renault and Peugeot. Sales in this subsector decreased again in 2013 (down 6.7%, to EUR 15 billion, after a drop of 13.5% in 2012) and orders have fallen again during the course of this year. Suppliers´ margins are constantly under pressure, as the powerful car manufacturers demand greater productivity coupled with lower prices. While car manufacturers´ equity is still quite strong, suppliers’ equity is weakening. This segment is very capital intensive, requiring both sizeable finance, for new investment and restructuring, and high working capital. However, banks are generally unwilling to provide credit to the automotive suppliers subsector. On average, payments in the French automotive industry take 60 days (end of month) and timely payment is important in this sector, with few protracted delays. We do not expect any fundamental increase in payment delays in the coming months. Neither do we expect insolvencies in the sector to increase in the short term. However, we have identified some weak players (e.g. in the stamping subsector) and take steps to avoid any impact on our customers from insolvencies in this segment. For suppliers in particular, falling domestic production has led to rising overcapacity: estimated to be as much as 40%. In the long term, a restructuring and market adjustment seems inevitable, either in the form of insolvencies or by ’clean closures’ (i.e. with support from shareholders, car manufacturers). Those mainly affected by overcapacity issues are suppliers that rank second or third in the subcontracting chain: especially those engaged in foundry work, small stamping and those producing items with low technology requirements. 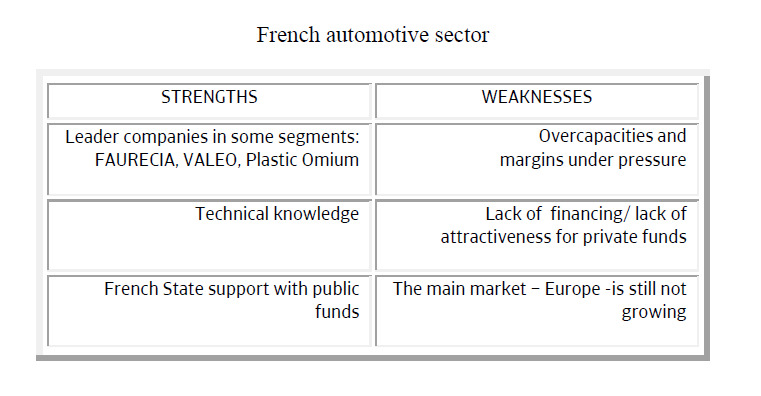 Despite the rebound in sales and the artificial boost to production achieved by government measures, our underwriting stance towards the French automotive sector remains cautious, especially given ongoing problems in the suppliers subsector. 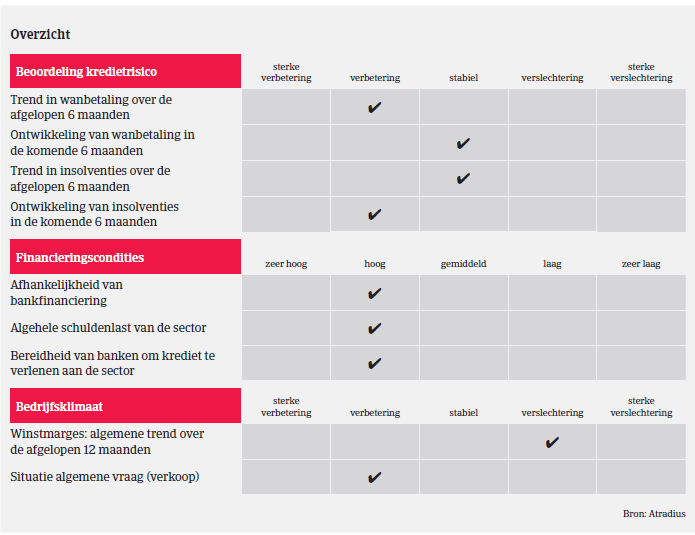 We continue to scrutinise businesses’ customer structure and export share, the level of EBITDA (Earnings before Interest, Taxes, Depreciation, and Amortization), financial costs and the level of short-term debt compared to sales. While we have to be vigilant when asked to increase existing cover, meeting our customers’ needs is a priority and we try to meet their requests whenever possible. Even if the buyer’s financial strength does not merit the full cover requested, we will try to give a partial approval: perhaps by setting a time limit or seeking a parent or bank guarantee.